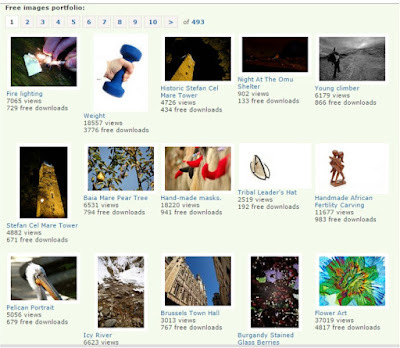 Above image is a screenshot of the latest free images on Dreamstime. The free images are consist of high quality photos, vectors or illustrations from Dreamstime contributors around the world. This Dreamstime section offers an opportunity to contributors to achieve great portfolio exposure by donating images. Some contributors claim that donating to free section helps promote their portfolio and eventually increased their sales. Last time, I also tried to donate two or three images from my portfolio. However, I found out that in order for an image to qualify for the free section, a particular image must be (a) online for more than one year in your portfolio and (b) image should have downloaded several times . Maybe sometime I will donate some of my most downloaded files because I believe this will advertise my portfolio. This section also offers an opportunity to those who are on a tight design budget, but still want to deliver fast and quality results. So, if you are looking for high quality free images to download? Then visit Dreamstime Free Section now! If you want to be a Dreamstime contributor and make some money out of your images (photos & vector) fill free to visit this their REGISTRATION PAGE.